Research can be fun – I’ve learned about all sorts of things I wouldn’t have imagined I’d ever need to know. I love it. Research for fiction, anyway. If I have to research which is the best phone or TV for me, I hate it. I just shut down. Oh yes! I really should start writing books based on what I want to research, though. Much more sensible! All the best with your new novel. Sounds like a fantastic story. Love the research trips – spa day. Brilliant and enjoyable no doubt. There has to be some perks here and there. Definitely putting it on my list. 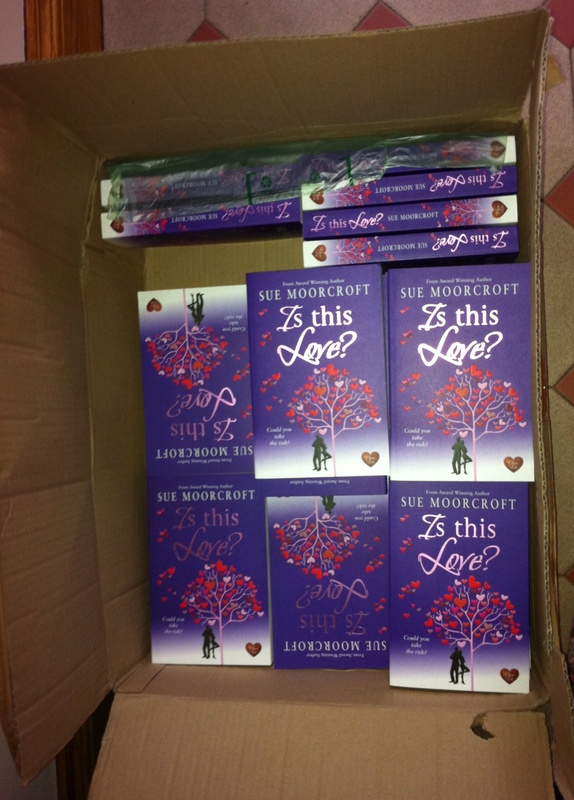 What a lovely sight – a box full of your own books! It was just topped by the photograph of that handsome alpaca. I really feel for you, Sue … research is a tough business – all that basking around on spa days and gazing at cuddly alpacas, hee-hee. Happy Publication Day! If there’s an alpaca involved then I’m your target audience. On my 39th birthday I paid $10,000 to our next door neighbours for a pregnant alpaca our Rhodesian RIdgeback chased into a feed trough (which was very strange since they were friends). So I’m very familiar with the accounting regarding valuable white cria babies, etc. But I would LOVE to read your book. Wow, Beverley, that’s quite a story! I think Sue and Adrian’s alpacas are more your ordinary everyday kind but there’s definitely a price tag attached. 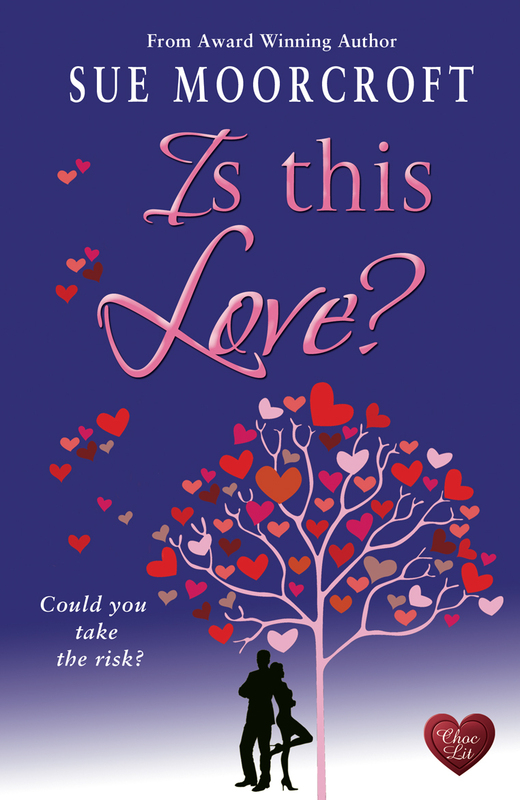 Sue, Is this Love sounds wonderful – I can’t wait to get my hands on it! I love your little teasers on the research you did – a fascinating glimpse into the book. Yoga, money and alpacas – ummm! Looking forward to the new book Sue – I am a bit of an alpaca fan – especially of the wool – which is fabulous to knit with. Expensive – but fabulous to knit and to wear. Good luck with Is this Love? Just reading your blogpost has made me think I want to get back into going to yoga regularly – maybe reading the book will force me off my sizeable writer’s bottom to actually go do it! I too am looking forward to another great read. I live yoga and when doing strange contortions in a class, often think it would make a good story. Glad you’ve written it! Thanks, Zana. I’ve done yoga for years and it always makes me feel good. I loved this book, Sue 🙂 I also have a very soft spot for alpacas! Wishing you lots of luck – I hope Is This Love? is a huge success! *sigh* Yet another on my “Must Read” list!! Random Trivia: there’s a herd of alpacas down the road from us here in Evesham. Those alpacas get everywhere … I hope you enjoy Is This Love? when you read it, John. Great to meet you last night, at Knighton Library. Thanks for making the effort to come over and I hope that you had a smooth journey home. Ooh, alpacas – some of my favourite beasts, I remember taking my grandson to see them when he was little. They have lovely eyes. I’m looking forward to reading your new book, Sue – sounds like another winner! Thank you, Margaret. I hope that you enjoy it. What an interesting story this sounds, Sue, think I need a spa day in my next book! I have a friend who keeps alpacas. Book sounds amazing, Sue – as always.